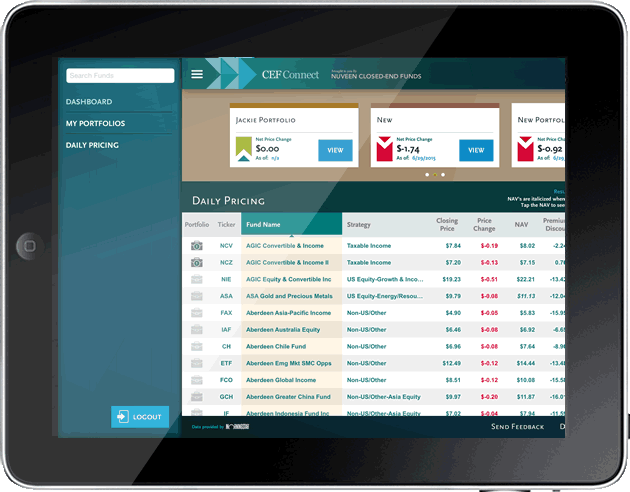 The CEFConnect iPad App provides convenient access to information about the entire universe of closed-end funds. This site does not list all of the risks associated with each fund. Investors should contact a fund’s sponsor for fund-specific risk information and/or contact a financial advisor before investing. Closed-end fund historical distribution sources have included net investment income, realized gains, and return of capital. For more detailed information on the distributions of a specific fund, please visit the sponsor's website. CEFConnect.com makes data for the universe of closed-end funds available as a courtesy to its users. The data is provided by Morningstar which gathers the information from publicly available sources that may only be updated periodically and may not reflect the most current information publicly available. Please see individual closed-end fund sponsors’ web sites for more timely information on specific closed-end funds. This material is not intended to be relied upon as investment advice or recommendations, does not constitute a solicitation to buy or sell securities and is not provided in a fiduciary capacity. The information provided does not take into account the specific objective or circumstances of any particular investor, or suggest any specific course of action and should not be considered specific legal, investment or tax advice. The content of this site, including but not limited to the text and images herein and their arrangement, are Copyright ©2019 by Nuveen, LLC All rights reserved.